At Music Street Journal we’ve joined a number of publications in a ban on reviews of digital only products. I’m making an exception for this release for a couple of reasons. The main reason is that this is essentially a preview of an upcoming release that will be available in physical format. 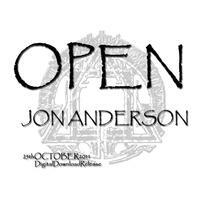 That release will be Anderson’s next album. He’s made this epic track available ahead of time in digital format. It is definitely an epic moving through a number of changes and alterations and covering over twenty minutes of time. Often times this one doesn’t really fit into the rock category, but there’s enough rock here to keep it interesting. It’s certainly something that gets better with repeated listening because it has a fairly large learning curve. The song opens with symphonically styled musical elements. Anderson’s first vocals come in over the top as this is essentially ambient and rather theatrical in a bit of a building process. It turns out towards something that resembles the type of music that made up Anderson’s first solo album, Olias of Sunhillow after a few minutes. The symphonic concepts are still present and it also feels rather like Yes music. Some guitar comes in after a while bringing more of that Yes texture. As the symphonic elements build out from there it really resembles something from the Magnification album. It keeps working getting modified and built upwards as it continues. It moves away from the symphonic a bit to an almost folk meets prog approach around the six minute mark. Then several changes ensue as the themes continue to be explored. The multiple layers of vocals really dominate here, but there are musical bits in place bringing more of that symphonic texture, too. Then around the eight minute mark it gets much harder rocking. It feels again a lot like Yes’ Magnification album. There’s some killer guitar work before it works to more Olias meets symphonic territory. This thing just keeps changing. Layers of vocals swirl as the music creates an almost film-soundtrack like sound. It drops way down around the nine-minute mark then powers up. Another drop back gives way a guitar solo dominated Yes-like jam. Then it turns quite symphonic, but still rocking in tone and nature. Shortly before the eleven-minute mark it drops way down. Then a definite classical texture rises gradually upward. Eventually acoustic guitar comes up from there and the track begins another building process, this one a very slow and gradual one. As it gets some more energy it becomes a soft rock styled number. Once more it drops down to near silence. Delicate music builds out from there with a bit of an Eastern styled cinematic texture. Around the sixteen minute mark another rocking motif enters, this one based around acoustic guitar. It builds upward from there. That eventually gives way to a symphonic meets progressive rock based section with more Anderson vocals coming in after a while. It continues reaching upward from there and becomes very symphonic again without losing the rock angle. That section finally take it to the outro to end.